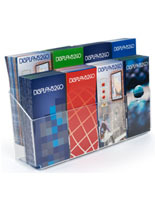 Multi-Pocket Holder for Many Leaflets in Small Space. 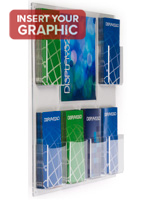 Clear Acrylic Allows Information to be Easily Seen. 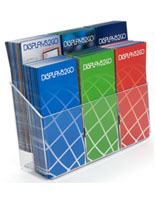 Permanent Dividers Keep Brochures in Place. 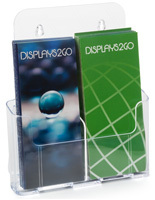 The 4-pocket acrylic pamphlet holder is designed for countertop or desktop use and will hold 4”w x 9”h brochures. 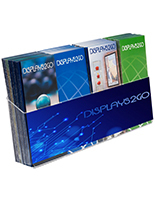 The clear plastic display has permanent dividers and so is not a flexible unit. The pamphlet holder for trifold literature is 2” deep and will keep many papers ready for distribution. There are 4 feet on the bottom of the clear plastic display to help keep it from slipping around while in use. 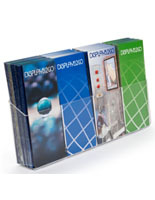 The holder is a compact display that will hold four different trifold leaflets in one place. The countertop unit for literature can be placed where there is lots of traffic for the most notice by passersby.